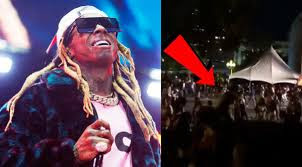 Wayne was onstage performing at the Georgia Freight Depot during the second day of the A3C Festival when someone claimed to have heard the shots. There was immediate panic as people ran to exit the area. A3C LIL WAYNE CONCERT SHOOTOUT. Several people were trampled during the stampede. In all, about a dozen people suffered minor injuries. Cops say there was no evidence of shots fired. There's a reason this alarm triggered such panic you'll recall, Wayne's bus was shot up back in 2015.